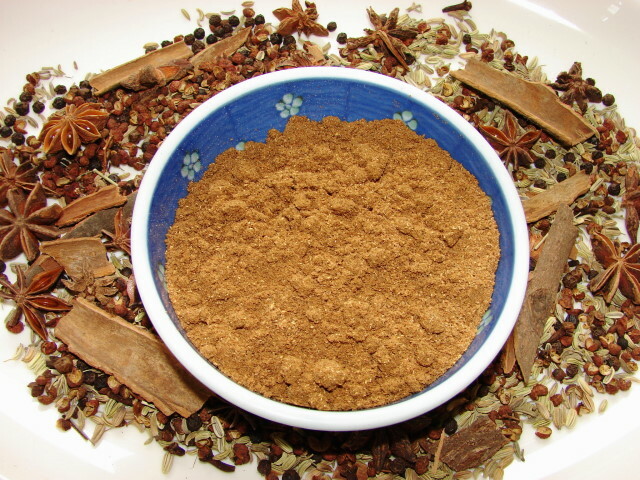 Chinese five spice is a classic flavouring in many Chinese cooking. I have bought and used many different brands of five spice powder. I noticed they all smell different and some didn't have much aroma at all. 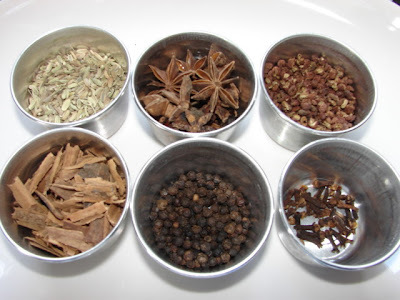 Though it is called five spice, it is not a concrete rule to use only five type of spices. Five spice powder can contain 5 or more spices in any proportions. Common spices used can be any of these spices, the lower ones on the list are less common. * some of the spices are not known or easily available outside China or Far East. I started making my own blend few years ago and never go back to bought stuff. Homemade is so much fresher, more pungent and cheap too. The only essential tool is a coffee or spice blender. Here is my blend and recipe if you like to give it a try; I normally use 6 spices. Sometime I also add 1 piece of dried mandarin peel 陳皮 too to give it a nice citrus scent. Look at this picture and see the difference in amount for this blend. A bit more or less of each spice is not critical. Only thing to remember is use clove very sparingly it's very strong. From top left: fennel seeds, star anise, Sichuan peppercorns, cassia bark, black peppercorns and cloves. Measure the spices. Break up the larger spice like cassia and star anise into small pieces. Put all the spices in a dry wok or frying pan, dry fry for about 2 minutes at medium heat stirring all the time till all the spices become quite hot and a pungent aroma is released. The purpose of frying the spices is to dry the spices to make them very brittle so they are easier to blend. Heating the spices also release the aroma. Leave the mixed spice to cool completely. Do not blend hot spice, this will give out a lot of heat, not only burn the spice but can also damage the machine. Put cooled mixed spice in a spice blender or coffee blender no more than 2/3 full. Blend or pulse for about 10 - 30 sec, till spices are blended to a powder. Remove the cup, shake the spices and reblend again if you have to. The ground spice will get a bit warm. Do not blend too long or the spice will overheat and spoil the aroma. Sieve the ground spice. If there is only little gritty bits left throw them away, if there is still quite a lot of large pieces left behind, blend and sieve again. Let the ground spice cool down then store in air tight glass container. I normally use jam jar. Ground spice does not store very well in plastic container and may absorb a weird plasticy smell from the container. This spice will keep fresh for weeks. Do not keep near sunlight or warm area. Do not blend too much and replace it with a fresh batch if the aroma has deteriorated after sometime. Brilliant, I have all those ingredients in and shall be making this ASAP. That looks absolutely amazing; good 5 spice is hard to find in the uk. Going to try this out- thanks!! Wonderful Sunflower. I was looking in the ingredients list and missed this for a whole week. Now off to follow your wise words. Hope you like this spice blend. I'm going to try the the addition of the dried peel, think this is an excellent variation.